Introducing clean, modern, minimal and creative presentation template Bundle in 16:9 1920×1080 Full HD and A4 & US Letter Printable Format. 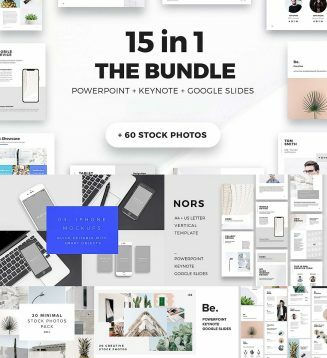 This bundle includes 15 presentations and 60 minimal stock photos. File format: .psd, .pptx, .key for Photoshop or other software. Tags: branding, corporate, creative presentation, google presentation, keynote, minimal, modern stock images, photo, powerpoint, slide, styled.